The Internet is a perfect place for sharing knowledge and learning online because it allows students and teachers to communicate easier with each other and also more efficiently. 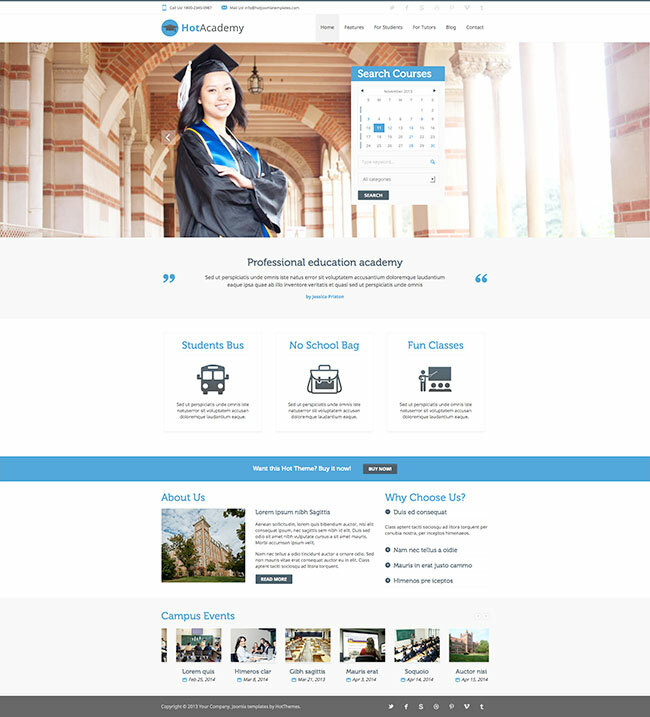 Education template can be used for the development of Joomla website for any kind of educational institution including universities, academies, elementary and high schools, etc. It comes integrated with jEvents component which allows making online class schedules. This is a handy feature and per our opinion, it's very useful for educational websites. Education is the key to success! People are learning and extending their knowledge from the cradle to the grave. There are many educational institutions that can find the Education template useful. Kindergartens don't exist just to keep children while their parents are at work, but also to educate them while kids are having fun. The time that children spend in elementary school is maybe the most important in life. In high schools, young people make crucial decisions about their future life and work. Finally, the universities are where people are becoming experts for specific fields of science. But, education doesn't stop there. Even graduates and those who are active workers must learn and extend their knowledge in order to be up to date with modern trends in their field. That's why we have courses, seminars, meetings and similar events where people are sharing their findings from practice. In the Internet era, online courses are not a rarity. Actually, they are very popular, so it's possible to study and graduate an university degree completely online! Commercial aspect is also important here. The key to the success of every educational institution is to be attractive for the new students. 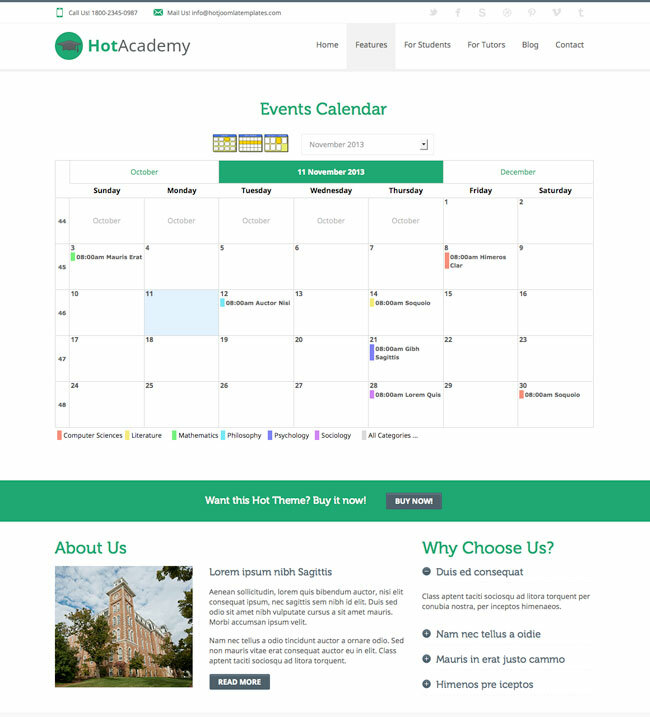 Joomla education template - Hot Academy is a responsive template and it looks good on all devices, no matter how students and teachers are accessing it: from the office using a portable computer or from the nearby park using tablet or smartphone. In order to attract visitors of the site, you can use any (or all) of modules that are included with template free of charge. 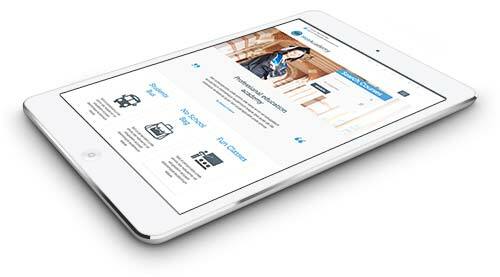 Responsive template, based on valid and clean CSS code, powered by Sparky Joomla template framework. 4 pre-defined styles with different colors. All colors are easily customizable in Sparky options (infinite color options). Customization of the Education template's layout and adding/removing module positions is easy. It's powered by Sparky's drag'n'drop Layout Editor. Change layout and element's dimensions easily whenever you need. Hot Full Carousel, Hot Film Tape, Hot Maps, Hot Carousel and Hot Gallery modules are included with Hot Academy template. Full support for jEvents component is included. All commercial modules included in this template are free for you, if you buy template (you save $15 per module). All extensions are pre-installed and configured. Tested with IE8+, Firefox, Chrome, Safari, Opera. Tested on Android and iOS mobile devices.